Do you want to preserve the memory of that awesome neighborhood fireworks show? Let’s discuss the best ways to try to make a memorable photograph commemorating the event. You enjoyed the photographic process. You are left with a photograph or photographs that you personally enjoy. Everything else is noise. Also, know that night photography, on its own, is sometimes a very challenging genre of the art; add the dynamics of pyrotechnics and you have an even more demanding photographic adventure in front of you. Therefore, approach the mission with an open mind, bring inherent flexibility to your creative process, do not let the technological demands overwhelm you, have fun, and, most importantly, enjoy the fireworks! My mission with this article is to get you set up for success. After that, the creativity and fun is up to you. 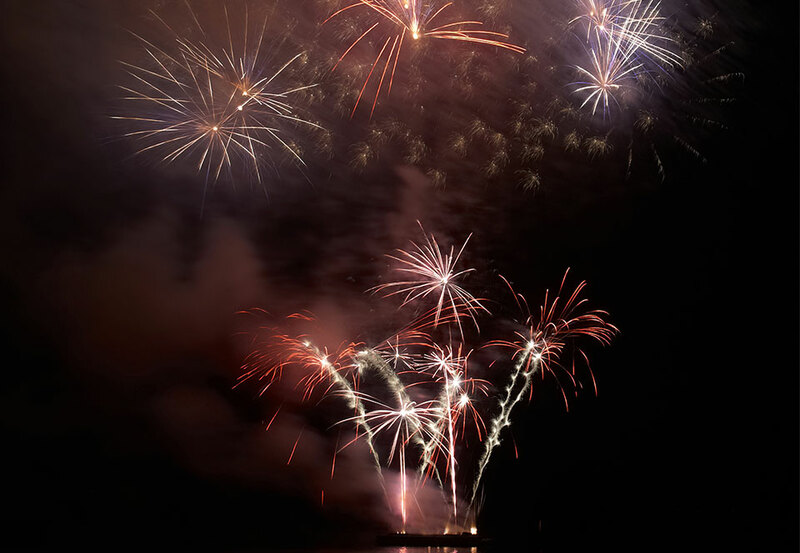 First, an SLR, DSLR, or mirrorless camera is likely to be the best tool for photographing fireworks. But don’t rule out point-and-shoot cameras; they often have a “Fireworks” mode, and other cameras are capable of capturing great fireworks shots, too. So, don’t be discouraged if you do not have the latest multi-million-pixel DSLR camera in your bag—just get out there and give it a try. Much of what I’m about to discuss is going to apply to any camera, but some will be specific to SLRs. Nighttime fireworks photography is night photography. Just like all night and low-light photography, there are some essential tools that are needed to ensure you get the results you want. A tripod. Unless you are a proponent of the artistic merits of camera shake with long exposures, you will need a tripod to hold your camera steady. A cable release. We will discuss exposure later, but a manual, electronic, or wireless cable release will also help you get the best results as, even with the heaviest, steadiest tripod and lightest touch, you will move your camera when you depress the shutter release. A spare battery. With modern cameras, a fully charged battery should get you through the night, but long exposures drain batteries faster, so why risk being taken out of the game before the grand finale with a dead battery? A pocketful of memory cards. Just like with batteries, it’s best to always have a spare whenever you are out doing photos. A piece of matte-black cardboard or plastic. This will come in handy if you want to capture multiple bursts of colorful fun. More on this later, as well. A stool. 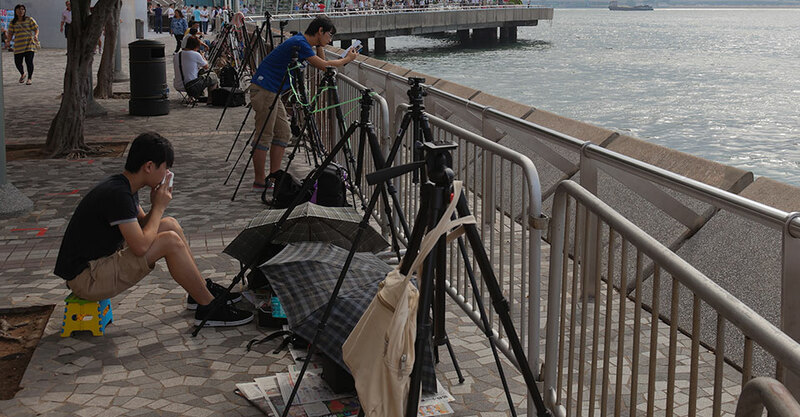 If you have a tripod that extends to great heights, a stool might allow you to stand above the crowd to get a better vantage point. However, please be courteous to those behind you. Everyone wants to see the show. A flashlight. Be ready to illuminate the dials and controls on your camera. Also, when you need to dig through your camera bag in the dark, a flashlight will help you find what you need. I have also used a flashlight beam to illuminate the legs of my tripod for those walking by, so that they do not punt my gear down a hill. One key to a successful experience with your camera and fireworks is setup. Of course, you can use these tips and techniques to shoot from your tripod, but some planning should go a good way to helping you get the image you want. Research your vantage point and get there early. Look at photos online for different shows and find out where people were standing when they got a photo that you like. Pay attention to framing and the size of the fireworks burst. Got a favorite cityscape or landscape? Find out when and if the fireworks will fill the foreground or background. Of course, you can just follow the crowd to the show, but sometimes it pays to stay further away and incorporate some geographic or architectural elements into your images. Also, before dark, figure out your framing. Did you see the same show the year before? Do you remember how expansive the bursts were? We will discuss lenses later, but, if your mind’s eye recalls the show from years past, tailor your setup to those memories. Also, if you are incorporating urban landscape features or other elements in the frame, remember that you need to expose properly for those elements while capturing the fireworks. Also, buildings are vertical and the horizon is horizontal. Depending on your shot, be mindful of leveling the horizon before it gets too dark unless you are looking for an artistic angle (no pun intended). This location scouting is going to play into your lens selection. Sometimes a wide-angle zoom and a telephoto zoom lens will be more than enough to capture the show. If you know exactly what you want to capture, a prime lens might be the choice, but a zoom will give you the flexibility to pull back to capture the entire burst or zoom in to let the streaks leave the frame. It all depends on what kind of image you are looking to get. Keep an eye on the weather and dress accordingly. When I lived on Whidbey Island, Washington, we used to joke that the Fourth of July was the coldest day of the year, since we would all be bundled up at the marina watching the fireworks. Speaking of marinas, floating docks and night photography do not go well together. Let’s talk about how to get your camera set up. Remember, this is a guide. So, remain flexible, change settings, and experiment as much as you want. Have fun during the show. It is unlikely you will set up your camera, capture the first firework burst, check your LCD, scream, “Success!” and then pack up to go home. Focus. Your camera’s autofocus system should be able to focus on a fireworks burst. However, if you want to avoid the focus “hunting” when the action is happening, you can do a few things. You can use the autofocus to set the focus during the first few bursts and then select manual focus so that the camera’s focus remains constant. Or, you can use manual focus from the outset and get your image in focus before it gets too dark to see. Make sure you verify your focus, especially if you bump the camera, zoom your lens, or if the fireworks appear closer or farther away than expected. Also, some photographers have intentionally blurred their fireworks images to get some interesting artistic results. Feel free to try it, but do not use “art” as an excuse for poor focusing. White Balance. “Auto” should be fine. Use your LCD to gauge your results and try other settings for different effects if you want. Again, be flexible. Noise Reduction. I suggest leaving it off. Firework photos are low-light photographs, but, in general, they will not be long enough to worry about a build-up of noise. Also, some NR systems take a second “dark” photo using the same shutter speed as your initial photo—taking you out of the action for however long your exposure was. Flash. Leave this off as well, unless you want to illuminate a foreground object. ISO. Set it low. Feel free to leave it at your camera’s native ISO setting. You should be using a tripod, and the nature of firework explosions does not demand high shutter speeds and ISOs. Use 100 or 200. Mode. Manual. Yep, I am the guy who wrote an article entitled Using Auto Modes is OK, but I am telling you now that, for fireworks, you want to select Manual so that you have control of your aperture and shutter speed to make needed exposure adjustments. Aperture. Mid-range. Again, you aren’t worried about the super-shallow depth of field here or opening the camera to capture a lot of light in an instant. Start at f/8 and work toward f/11 or f/16 if you need to. Or, go the other way. Stay flexible. Also, the mid-range apertures are going to give you the sharpest results. Vibration Reduction. Off. These systems generally do not play well with tripods, so shut them off. Now that you are all set up with your tripod and camera ready to go and cable release in hand, the rockets are launching and the shells bursting. It’s time to take photos. What exposure should you use? Well, like I said above, Bulb is the preferred choice, so you can open the shutter when the shell bursts and then close it when the streaks have tapered off. With fireworks photos, there may be a fine line between the premature closing of the shutter and leaving it open too long. It is very easy to overexpose a fireworks photo, so, if shooting digital, keep checking your LCD to make sure the shutter isn’t open for too long. If the scene is too bright, you may stop down your aperture and use a similar shutter opening period, or let the shutter close sooner. Not bright enough? Open your lens or take a longer exposure. Remember, stay flexible and adjust as needed. Each fireworks show and burst is different, so there is no magic exposure to dial in and use. If you have incorporated elements into your composition, such as buildings, bridges, people, trees, etc., you need to keep in mind that properly exposing those elements may limit your flexibility. For example, if you have a city skyline in the image that is properly exposed at f/8 and 15 seconds, you will find that capturing 5 seconds of firework bursts may underexpose the skyline to unacceptable levels. The opposite will be true for exposures that are too long. If you need to keep that skyline exposed just right, you will have to adjust your aperture, ISO, and/or shutter speed to get the results you want while managing the exposure for your compositional elements. Fireworks leave smoke in the sky. Unfortunately for the experimenting photographer, the earliest starbursts are going to be the “cleanest” unless a nice breeze is keeping the smoke moving out of the fireworks zone. This is another thing to keep in mind while shooting since smoke/haze will reduce sharpness and alter the exposure as well. I mentioned a black card earlier. Use this to capture multiple, non-simultaneous bursts on the same exposure. Open the shutter with the black card in front of your lens. Drop the card to expose the lens to capture a burst and then cover the lens back up. Repeat for the next burst. Again, if you want. This technique adds more light to your image than the single-burst shots, so review the image and make adjustments if needed—close down your aperture a bit to keep from overexposing. And don’t try to capture every burst of the entire evening. You won’t. A word of caution: Fireworks photographs can be fairly tricky for many photographers. Please, please do not let the photographic process, or a struggle with your gear, get in the way of enjoying the fireworks show. This article should help you get on the road to success, but, if you aren’t getting the results you want, feel free to take a deep breath, step back from the camera, and enjoy the event. Or, if you are determined to get an epic photograph, change your settings, experiment, and keep trying—you will only improve your technique, and, post-game image review might help set you up for success for the next fireworks show. Why am I mentioning this? Because I have struggled with fireworks photography myself. Also, I have watched the entire fireworks shows through a camera viewfinder while worrying about how the photos were going to come out instead of enjoying the spectacle with my friends and family. Don’t lose your balance here. Enjoy the process, but also the fireworks! Lastly, if you have your technique down, feel free to push yourself artistically. There are a lot of great fireworks photos out there—try something to make yours stand out—incorporate different landscape elements, change your perspective, zoom in and out while exposing, think abstract, gain access to an inaccessible location, vary your capture technique, etc. “See” the fireworks differently, make art out of the fireworks, and have fun doing it!